Enveloped, spherical. Diameter from 80 to 120nm. Glycoproteins at the surface of the envelope are arranged on an icosahedral lattice, with T=12 symmetry. Segmented Negative-stranded RNA linear genome, L segment is about 6.4kb, M segment about 3.2kb and S segment about 1.7kb. Transcription starts by viral RNA dependent RNA polymerase (L) binding to a promoter on each encapsidated segment, and is terminated by a strong hairpin sequence at the end of each gene. These are capped by L protein during synthesis using cap snatching , but are not polyadenylated. S segment uses ambisense strategy to encode for several proteins: both genomic and antigenomic RNA are transcribed. The hairpin sequence is a stop polymerase signal which prevents ambisense transcription from producing dsRNA. M segment encodes for several polyproteins by leaky scanning, which are cleaved by host protease into Nsm-GN, Nsm, NSm',Gn and Gc proteins. 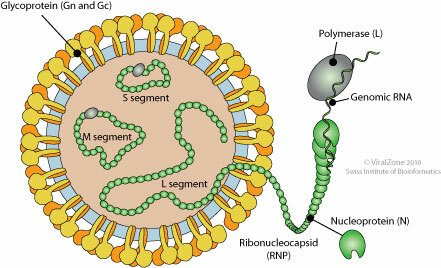 ASSOCIATED DISEASES RVFV: influenza-like illness, rarely hemorrhagic fever. Abortion in cattle. The Rift valley fever virus NSs protein instead plays a role in the inhibition of the host transcription initiation by acting on host TFIIH.